> Do you ever have a plant growing that you have no idea what it is? Let me know if you recognize either of these. I usually will pull something if it’s not something I purposely panted, but every once in a while I let one go to see what it creates. That happened a few months ago. I strated seeing the usual thistle weeds around the beds, but one of them really stood out, so I let it go. Here’s what the leaves look like. My thought is that maybe this is a giant sunflower- like a Maximillian variety. I had some of those seeds and planted them around and who knows if I was in a weird mood and planted some right here. That’s the problem with seed insanity- you can’t remember where you put them, you just want to GET THEM IN THE GROUND AND OUT OF MY SEED DRAWER, DAMMIT! and it kept growing and growing- this is it on the right side. next to ANOTHER crazy big plant that I have no idea what it is. Here’s the other one up close and it doesn’t look like a sunflower. In fact, there are two of these and the second one is branching out into 4 branches. (sigh) Seed planting frenzy will come back to haunt you every time. 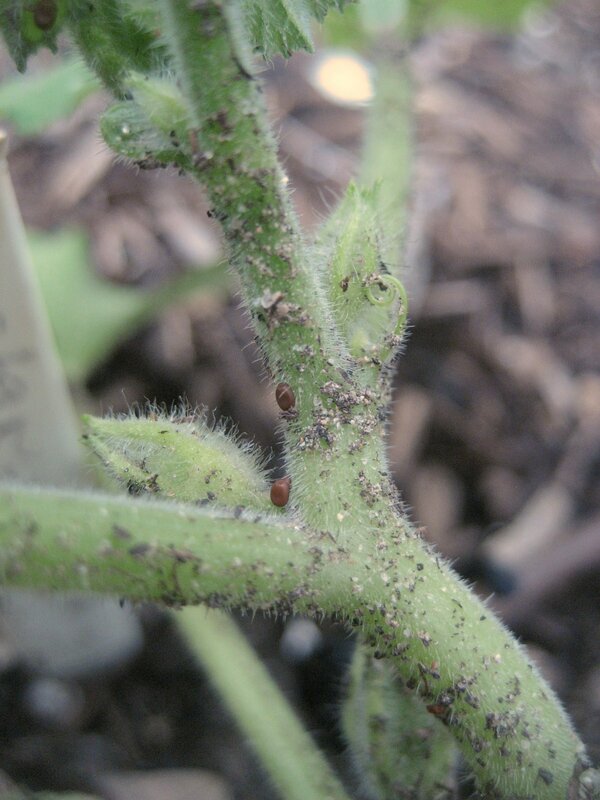 >A warning to all of my fellow vegetable gardeners out there…here come the squash vine borers. I always hope this year will be different. But my hopes were dashed yesterday when I discovered the first of the squash vine borer eggs on my squash and zucchini plants. I found at least 5 on every plant and usually a lot more. You have to really get close and look. Here, you can see the eggs as the small, circular brown things amidst all the dirt the rain has been kicking upon the plants. That’s usually how you can see them. The eggs look just too perfectly circular compared to all the irregular dirt pieces. And you really have to look all over. 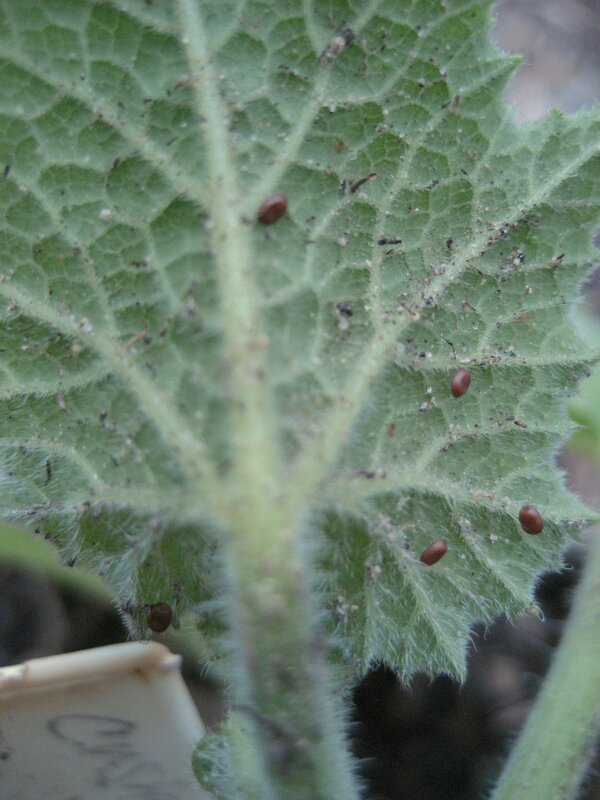 At the base of the plant, on the back of the leaves, at stem joints. 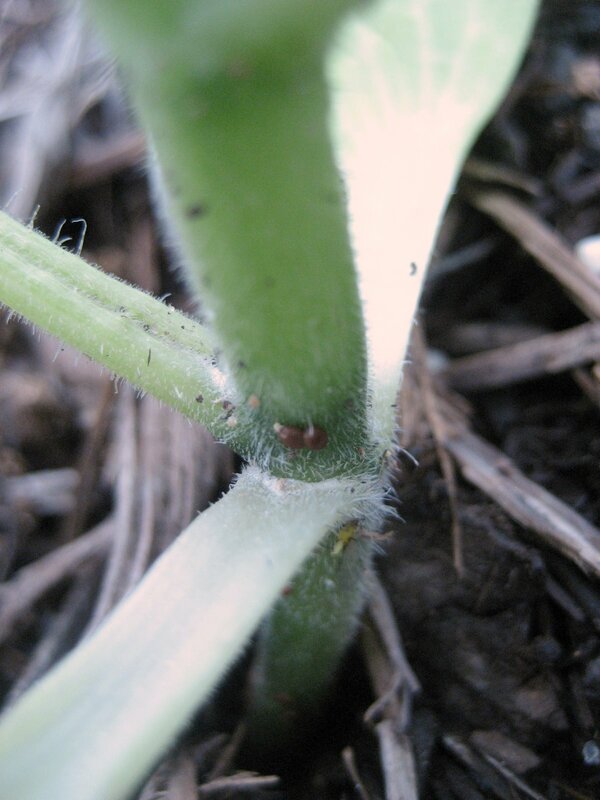 My squash bugs are even brazen enough to just pop them right on top of the leaves. Do they really think that is the best location or are they just taunting me? I just gently remove the eggs and then swish my fingers in a small cup of soapy water. But it drives me mad knowing that there are more eggs out there that I surely didn’t find. So I give my squash plants a good dusting of BT all over them so if the little caterpillars eat some of a treated leaf, they will not live much longer. Still organic. The alternative is horrible to watch your plants go through. I know, I watched it happen last year. 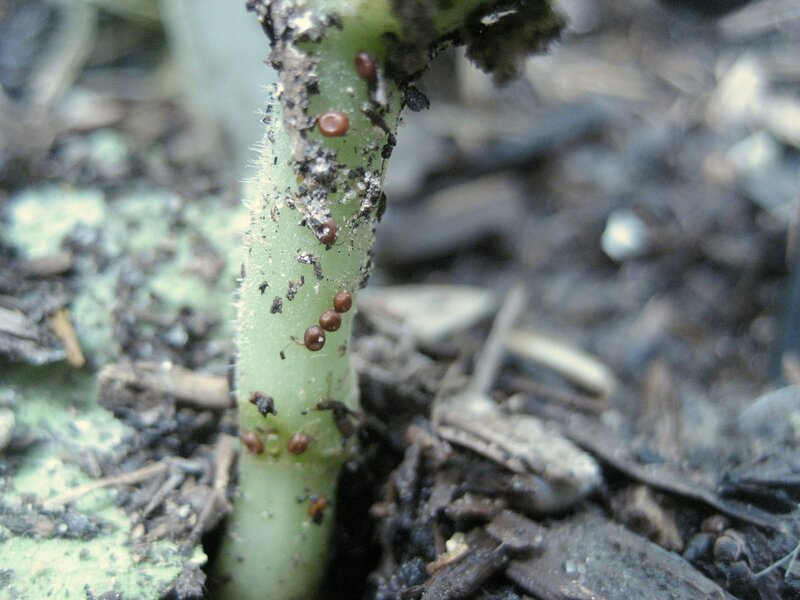 Having to dig borers out of your plants is awful and often is too much for the plants to survive. Another approach you can take is to cover your young plants with row cover until blooms appear, to protect them at least for some length of time from the eggs. I didn’t do that this year, but I will add it to my arsenal next season. 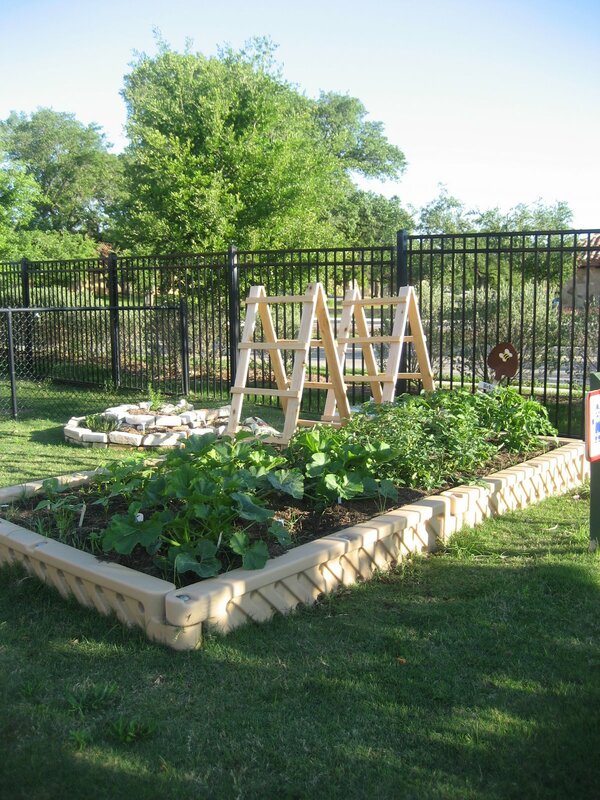 The Travis County Master Gardeners are offering two free public seminars this week. 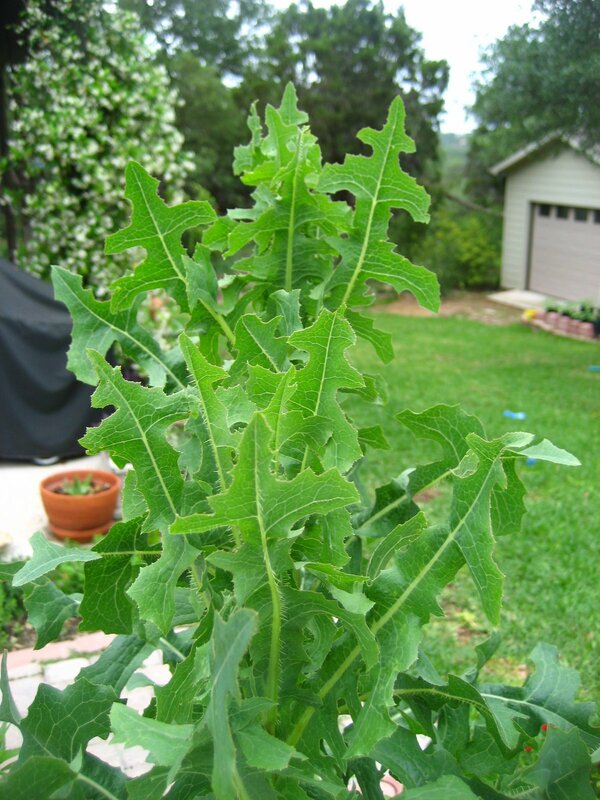 Having trouble picking the right plants for your Central Texas garden? 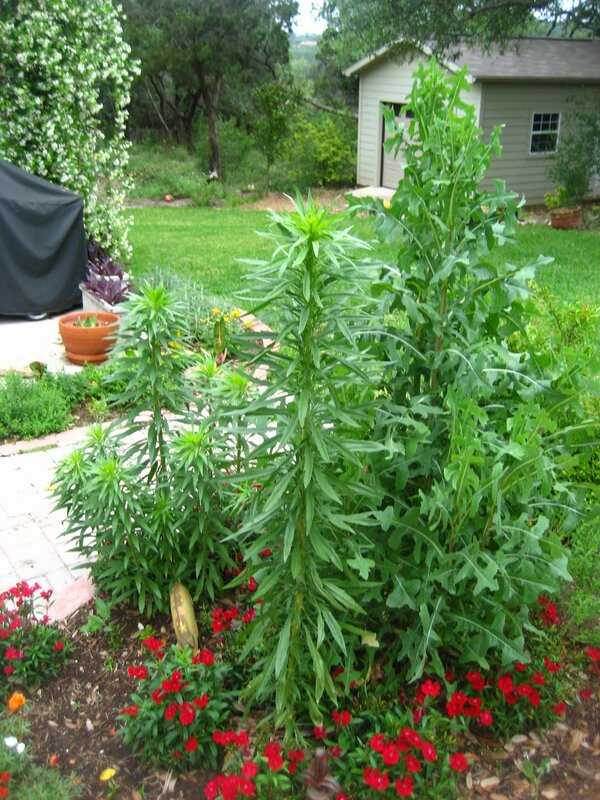 Attend our Going Native seminar and hear more about the beautiful native and adapted plants that can grow well in Central Texas and still be earthwise plant choices. Let us help you discover plants that are drought tolerant and resistant to pests and diseases, yet offer the color and texture you desire in your garden. 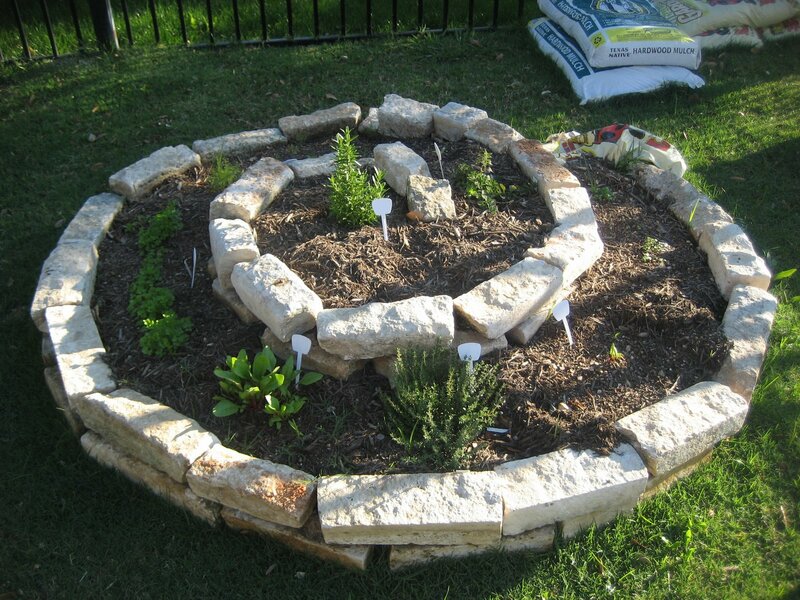 These plants will allow you to build a breathtaking garden while using plants that require less fertilizing, less watering, and less chemical control. 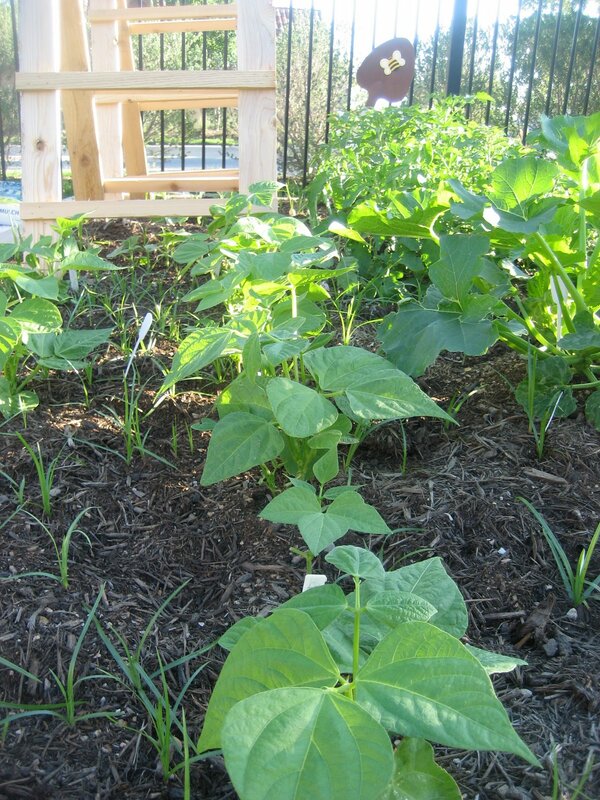 Going native is an experience everyone should have in their garden! This seminar will teach you how to build a habitat that is more attractive to beautiful songbirds, butterflies, frogs, and other beneficial wildlife. Using native wildflowers, shrubs, and trees will increase the beauty of your property, protect the environment, and provide a nurturing refuge for all types of animals. Requirements for building a certified wildlife habitat will also be covered. >This is my first year growing potatoes in the garden. Potatoes get planted around Valentine’s Day here in Central Texas so I had my certified seed potatoes from Callahan’s, both red and white varieties. I just don’t have enough space for potatoes in my regular vegetable garden so I chose a bed I have in the back yard that I have always used as a bit of a nursery for newly divided plants or ones I have not decided where they are going. I cut the potatoes into seed pieces, each with a few “eyes” on it. Those got planted about 4″ deep. I thinned when I began to see growth to about 10-12″ spacing in between. Potatoes grow above the seed piece off of the stem of the plant, so in order to develop potatoes that don’t turn green, you need to protect them from sunlight. 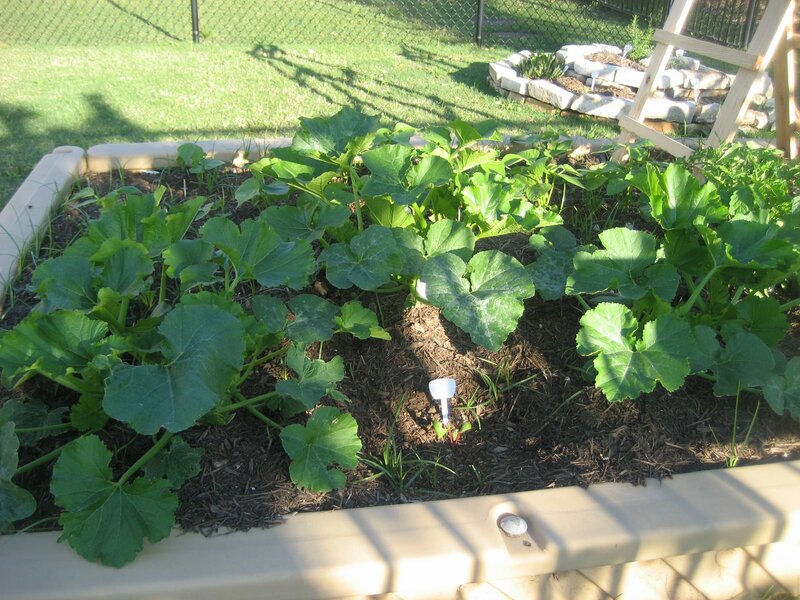 This can be achieved by pulling up dirt or mulch around the plant when they are 6-8″ high. 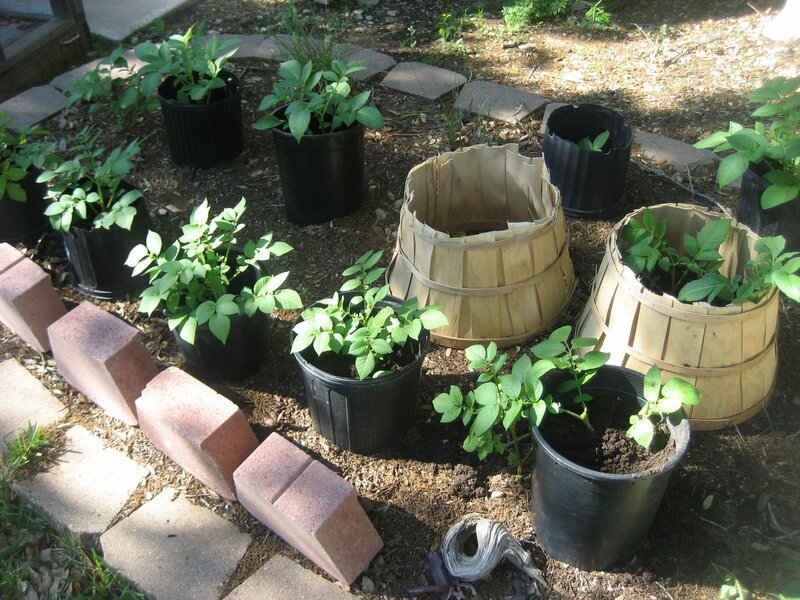 I took a tip from Patty Leander and am using planting buckets and baskets with the bottoms cut out to keep the soil close to the plant and not have it wash away in the rain. Harvesting should happen around late May or June. Keep your fingers crossed. >Ever since I can remember, green has been my favorite color. My eyes are green, and it’s the feature I got the most comments on growing up. Everyone else in my family had brown eyes. My green eyes came from my grandmother. It made me feel special to have inherited the beautiful green color from her when no one else did. My mom used to say that my eyes would get fiery green when I was mad or upset. When I was a teen and color mascaras were in vogue, I used to wear green mascara. I thought it made me stand out. When I decorated my daughter’s nursery, I chose a beautiful pale green color that I felt was calming. On the day I gave birth to her, I did a yoga practice in her room as the sun was just coming up. We remodeled our bathroom a few months back. 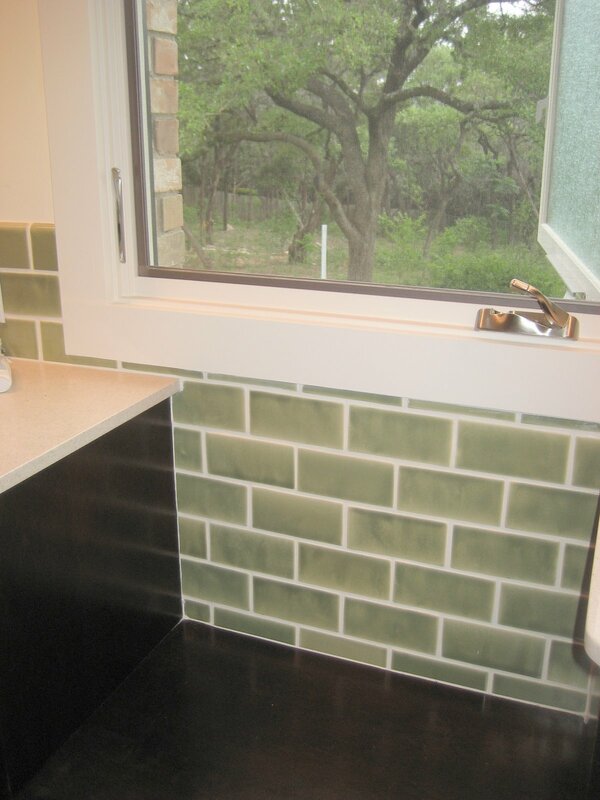 I was responsible for the tile choice and I had almost completed a two-hour long session at the tile store choosing a neutral slate when I walked to the back of the store and saw a celadon green subway tile. I dumped all of my previous choices and planned the rest of the remodel entirely around using that tile. I love the bathroom, it makes me feel calm and I listen to the birds call through the window to me in the morning. Is it any wonder that I would become a gardener, loving the tender green shoots that emerge in spring? It must be in my genes. 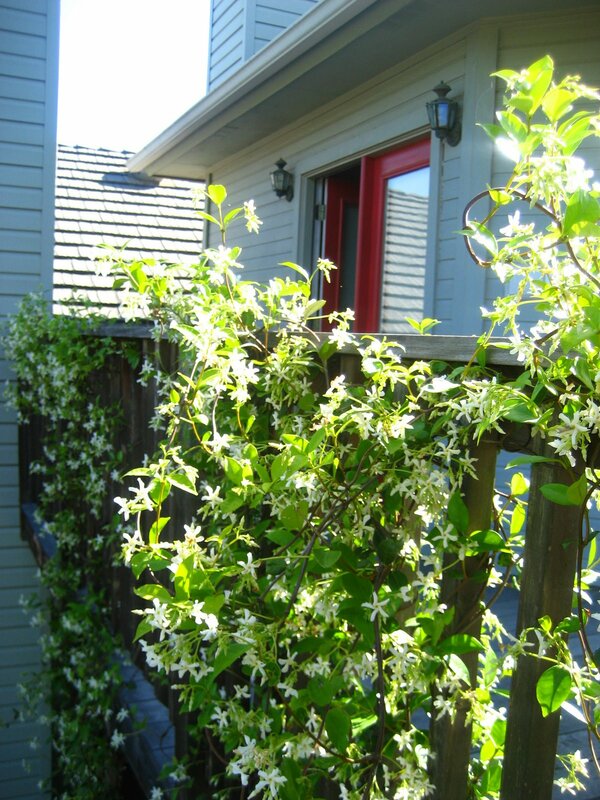 > I left for vacation with a little regret as I had seen my Confederate jasmine had buds all over it and was destined to burst into bloom at any moment. I couldn’t bear the thought of missing the show, as it is one of my favorite plants and I adore the aroma. So I was thrilled when I returned apparently right in time for the big showstopper. 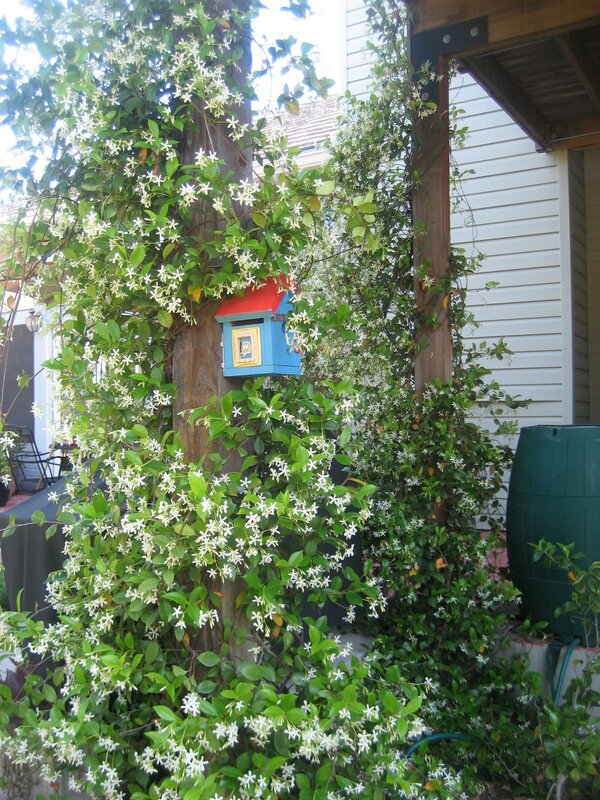 The entire two story of vines is in full bloom. I hope our little chicks in out blue birdhouse are immune to the smell, because otherwise it must be overpowering to actually live inside the vines. These vines were brought over from our old house and transplanted at the foot of the deck posts. I gave them a little wire training wire to help them find their way up. And they have just taken off ever since. They have now reached up top the second story deck and climb all over the railing outside of my office. I keep the door open through most of the day so the smell can permeate my office as I work. 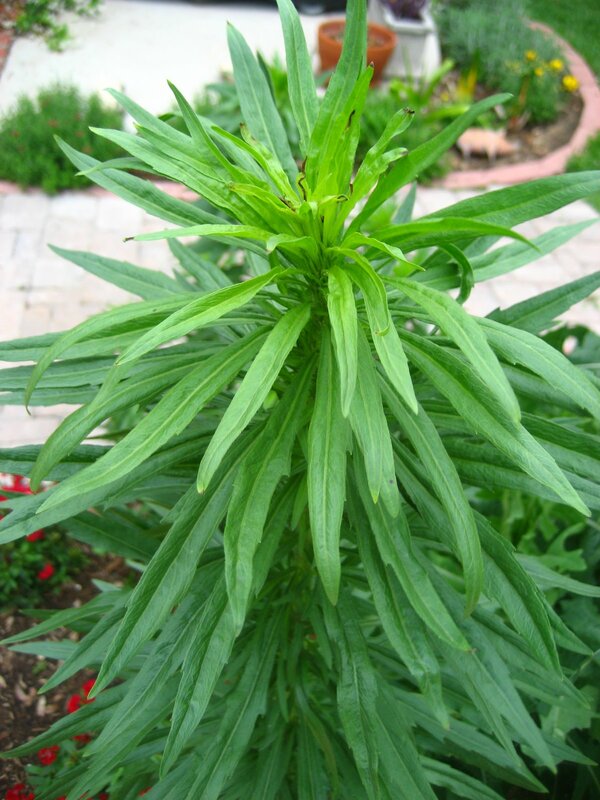 And even after the flowers are gone, the plant is an evergreen delight, offering foliage through the entire year. The flush of growth that comes in spring is a very light green color and advances the plant further along it’s climbing path. Light: Bright sun to part shade. Moisture: Average water. Can tolerate drought once established. 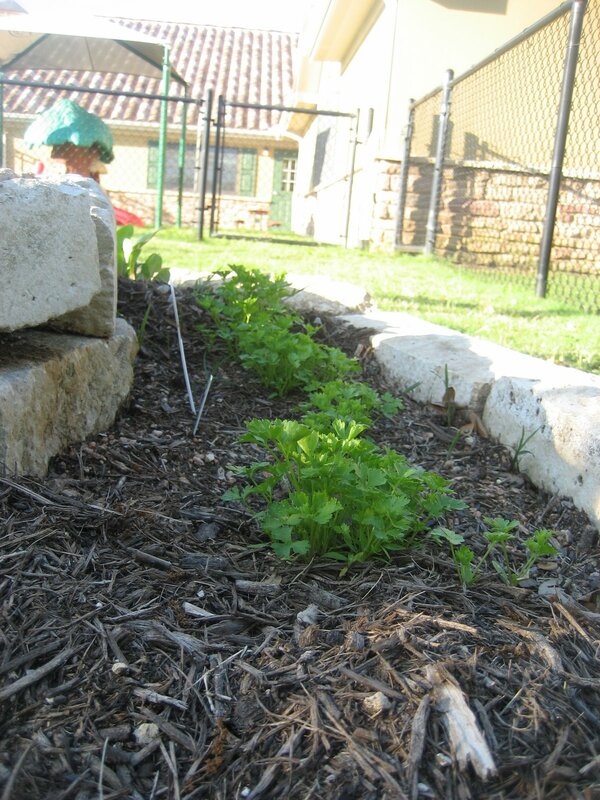 >School Garden Update- Time for Thinning and Weeding! Well, apparently while I was gone on vacation, someone gave the school garden that I am helping out with a dose of steroids, because I came back to zucchini plants that desperately needed to be thinned and tomato plants sprawling all over. I am so pleased with the progress and it is a great feeling to be out there in the morning or afternoon and have the kids run over from the playground and ask “Jack’s mommy, what are you doing in there?”. Needless to say, they are so excited. John helped me build some cucumber ladders so our cukes could get off the ground and not crowd the other plants. I brought in the tomato cages yesterday. While putting them on, I was amazed to see our first little tomatoes growing on the cherry tomato plant. When I told the kids, you would have thought I told them that candy was growing in the garden. The second order of the day was the nutgrass. Did you see it all in the picture above with the beans? My god, it’s like someone specifically ordered a bucket-full of nuts to be dumped in here so I would have to battle them for the rest of my life. They get a little rain, and pop. It actually gets easier to weed as the veggies get bigger because the veggie plants can hold up better to brutal weeding than the little tender veggie seedlings can. So I spent about an hour carefully trying to pull the grass WITH the nut out. Because if you leave the nut in, it just sprouts three more plants. And those plants form seeds that sprout three more plants. And so on. And so on. Like Facebook, but in the garden…with weeds.